I am pleased to present to you the Dishing it Up recipe hop along with this fine group of ladies: Thrifty Texas Penny, Mama's Money Tree, Deals From Ms. Do, Saving Myself Silly, Dearly Domestic, 20 Something Saver, The Happy Lil' Homemaker, Saving By Design, and Eating With MiMi. 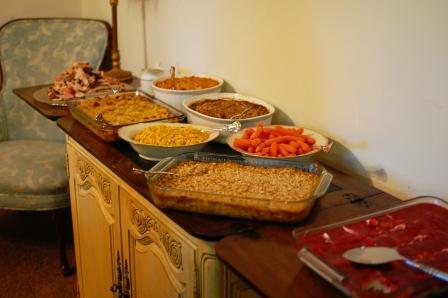 Every Thanksgiving my Momma makes a squash casserole that gets rave reviews. I don't know why we don't have it more often. Try it out and see what your peeps think. Boil squash in salted water for 7 - 10 minutes until soft. Drain; add soup, sour cream, carrots, onion, pimiento, and 1/23 pkg. of stuffing. Mix butter, salt, and pepper. Put in a large casserole dish and top with remaining stuffing. Cook for 45 minutes at 350F. This sounds really good :) I have still have squash from my garden that we need to use up, so we are definitely going to try this one. Thanks for sharing it! Ms. Simplistic Savings, you simply must try this recipe if you have leftover squash from the garden. It is so yummy and folks will rave about it. Thanks for stopping by!